Concrete is a popular and durable ground covering. Over time concrete begins to wear down and form cracks. Depending on a number of factors your concrete may show signs of damage faster or slower than average. Years ago it was common to rip up and replace old concrete at the first sign of cracking. Today, everyone is concerned with saving money and utilizing fewer resources, creating a larger emphasis on repairing concrete whenever possible. 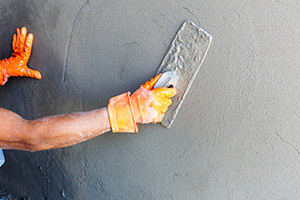 Concrete repair techniques have greatly improved, granting greater strength and durability to repaired concrete. When concrete is properly repaired, it can look like new and last for a very long time. Repairing concrete can also save you money and time, but remember concrete repairs are only as good as the original installation of your concrete. A professional can assess your concrete and provide answers if you need to replace or repair it. Here we explain how to tell if your concrete needs to be replaced or repaired. Including different types of damage, and how to fix concrete cracks. Why Do Cracks Form In Concrete? A professional can identify the cause of concrete cracks by simply looking at the exposed damage. The type of crack will help determine the right solution, either to fix or replace your concrete. Check Crack or Shrinkage Cracks are easy to notice and identify. They typically only impact the top layer of your concrete. A shrinkage crack is completely normal and often occurs during the initial hydration process when concrete is known to shrink a little. Structural Cracks or Settlement Cracks are large, reaching from one side of your concrete, all the way to the other side. Grade preparation and soil shifting can both contribute to structural cracks in your concrete. An epoxy can be used to fill in these cracks so that further shifting does not occur. An anti-fracture membrane might also be necessary. 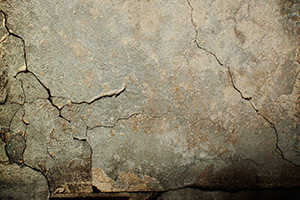 A crack in your concrete can be a huge eye sore and when left untreated, small cracks can turn into much bigger cracks. In order to fix a crack a number of steps must be carefully conducted. When Do You Need To Replace Your Concrete? In many instances concrete can be repaired instead of replaced. Still, some cracks are serious enough to warrant the need for removal and replacement of it. The extent of damage will determine if repairs are possible, the longer cracks are left untreated the more severe they become. Understandably, it can be costly to replace. Therefore it’s important that you have a trusted expert evaluate your concrete to see if it needs to be replaced or if it can be repaired. While some try and repair alone, without proper knowledge and experience the problem is likely to arise soon after repairs are made. At Turnbull Masonry we are experts when it comes to removing, installing, and repairing. Our repairs offer you an affordable solution for great looking concrete.